So tonight I tried making those homemade hamburger buns...again. (I failed the first time a few weeks ago). I wanted to post that recipe for you for your 4th of July burgers but, yeah they went to the garbage! I think the third time is going to be the charm though because at least I know what I did wrong. I am not giving up! I am sure it is time for me to take a bread making class! However, something good did come out of it in that I really wanted bread to go with our soup so I started over with biscuits. I've had this recipe sitting in my to-be-tried file for some time and I am so glad I finally did them. I've made other versions of these but this was by far the best. I really do not think you could improve much on this recipe and besides they are extremely easy. We usually like these biscuits with fish (sort of a Red Lobster at-home thing) but they would be wonderful with whatever you choose, I am sure. They are melt in your mouth goodness. Preheat oven to 425 degrees. In a medium bowl, combine flour, baking powder, garlic powder and salt. Cut in shortening and butter until coarse crumbs are formed. Lightly mix in grated cheese. Mix in buttermilk just until moist. Do not overmix or handle too much. This is the secret to melt-in-your-mouth biscuits. They will be tough if you over-mix them. Drop the biscuits onto a greased or lined baking sheet. Bake for 12-14 minutes, until browned and golden. While the biscuits are baking, in a small bowl combine three tablespoons melted butter, parsley flakes, garlic powder and a pinch of salt. 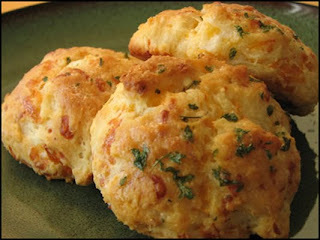 Right when the biscuits come out of the oven, brush the butter/herb mixture over the biscuits evenly. Serve immediately. Enjoy! I'm on The Foodie Blog Roll!